Arsenal defender Shkodran Mustafi has made a potentially very exciting claim about life under new manager Unai Emery in the wake of a strong performance and result against Liverpool. The Gunners drew 1-1 in an entertaining and even contest at the Emirates Stadium at the weekend, showing great character to equalise late on after going behind in the second half. Mustafi believes this was the best performance yet of the Emery era, hinting that it was the first time the players really executed his tactics perfectly from start to finish. The Germany international’s claims therefore suggest that even better performances should be ahead for Arsenal, who have looked solid this season without being particularly spectacular. 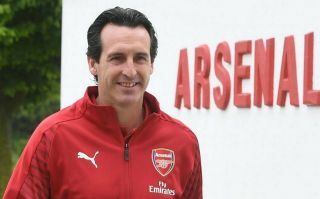 Emery took on the challenge of replacing Arsene Wenger after 22 years this summer, but has done well to quickly implement some tactical changes in the squad. Discussing the impact the Spaniard has made, Mustafi praised the way the team presses now and the more detailed level of instruction from the manager to make the side more solid at the back. ‘For me personally, the biggest thing was that he’s someone who really knows what he wants from each player. He tells you exactly what he wants you to do, but gives you freedom to expose your talent,’ Mustafi told Arsenal.com. ‘When we don’t have the ball, he tells you where to stand and how to get it back, when we have it, he gives you options you can use. You can decide which option you choose. ‘For me it’s a good mix between freedom and discipline, and having the same plan in the whole team. I think that’s what we saw against Liverpool. That was the first game where I felt like we came out from the first minute and were everywhere until the 90th minute. ‘I think that we are very good attacking, and that makes the defensive work a bit easier. When you attack well, and even when we lose the ball, we press straight away to win the ball back high up the pitch. That makes it easier for us to defend because you don’t always have to go back 60 or 70 yards back to win it in your own box.